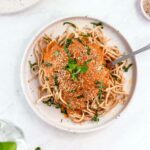 Simper and super quick vegan red pepper pasta. Creamy, packed with nutrients and so easy you could make it with your kids. It keeps well in a refrigerator, making it the perfect meal prep option. This is for lovers of creamy pasta sauces that don’t actually want to use cream. Regardless of your skill level, this pasta will be a true cooking triumph. Whereas I love setting myself up for a complicated challenge, there are days when you just need something super simple. 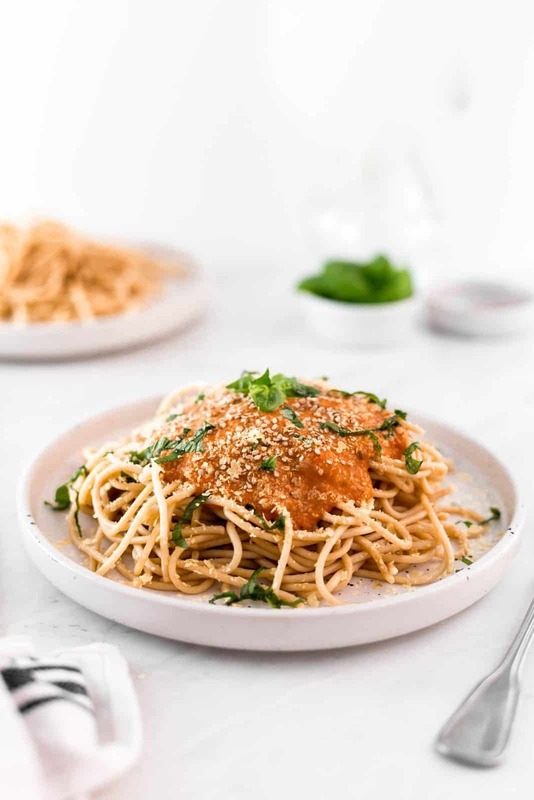 This delicious recipe is a lifesaver for all those days I’m in a huge hurry, but still want to eat something healthy. No-Cream Creamy Pasta Sauce? YES Please! There are plenty of reasons why you might be looking for no-cream alternatives. You might find cream too heavy or perhaps you simply can’t find a vegan version in your area. Of course, you might also want to switch out cream in an attempt to eat healthier food. Depending on where you live, vegan cream can be expensive or you might simply not like the taste. 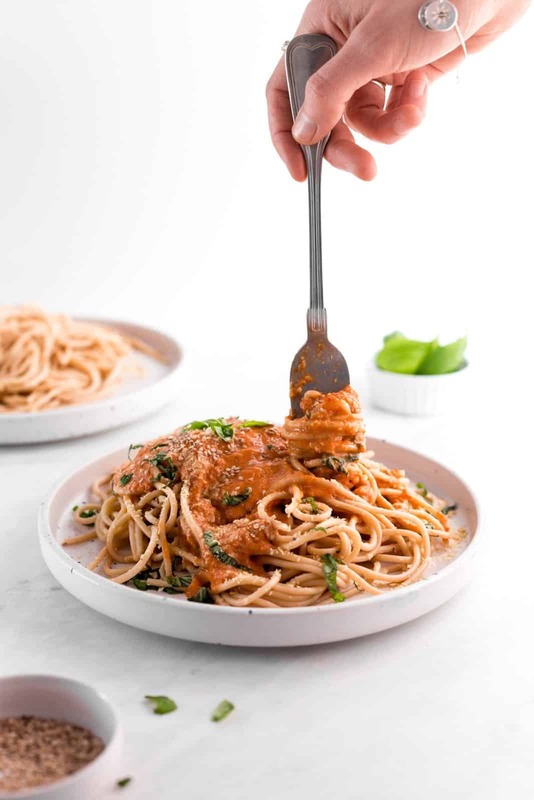 But no need to worry – with a few tricks up your sleeve you can still enjoy the creamiest pasta sauces without ever using any cream! Read more nutritional info on bell peppers here. There’s not many times I can say a recipe was born out of laziness. I try to keep my recipes super simple, but most of them require conscious efforts to come up with something completely unique and require me to carry out various re-tests. But pure old laziness was the cradle of this vegan red pepper pasta. Secret Ingredient Revealed – Peanut Butter! 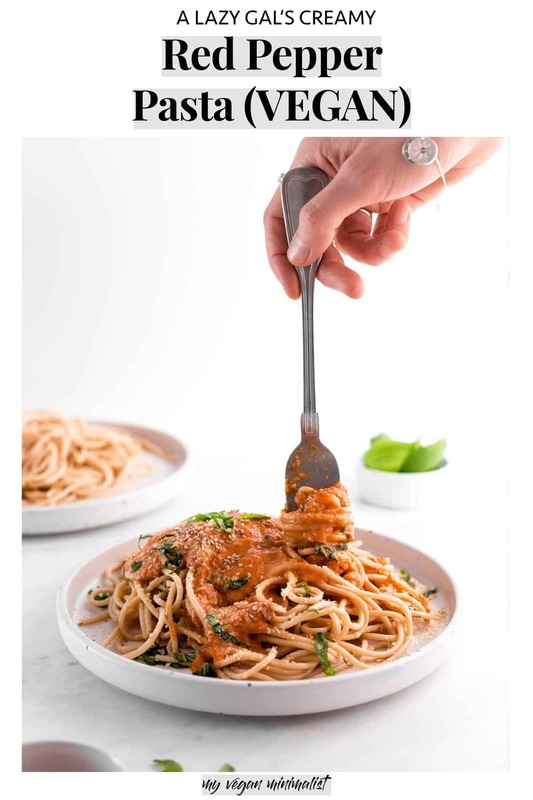 I know what you’re thinking – is she actually going to add peanut butter to pasta sauces now? Oh yes! Believe me, it’s been tried and tested on multiple occasions and you need to give it a go yourself. Adding peanut butter to my pasta sauce has totally revolutionised my cooking. Big disclaimer – you need to use 100% peanut butter (with no sugar added) and go for SMOOTH, not crunchy. Many big supermarkets now sell their own natural peanut butter (Aldi does too and it’s super cheap!). You can also find it in every healthy food shop like Holland & Barrett. If you’ve got a good food processor you can even whip it up yourself! Peanut butter not only adds a gorgeous creamy texture, but also adds a real punch of flavour. It’s also packed with nutrients, so you can’t really say not to that, right? Enough rambling – if you liked this recipe, don’t forget to leave a review or comment below. I’m so intrigued to hear about your takes on this super duper easy pasta! Rinse grilled peppers and add to a pan. Warm up on medium heat for 3-5 minutes, then add the rest of your ingredients. Stir well and don’t worry about it being a little bit messy. In another large pan, bring salted water to the boil and cook pasta. Once your sauce is bubbling, simply whiz using a hand blender or transform to a blender and blend until smooth. Serve with fresh chives or basil, sesame seeds and a sprinkle of vegan cheese. * I know that serving sizes can vary drastically depending on your personal preferencing so I wanted to leave this one entirely up to you! If you’re starting out as a vegan or just want to discover simple vegan recipes make sure to follow me on Pinterest, Instagram and Facebook. I’ve also compiled a list of 90 vegan meal ideas you can download for free here. Tajda Ferko is a recipe developer and food photographer based in Manchester, UK. She creates easy, accessible and indulgent vegan recipes. Her photography has been featured on Best of Vegan, Vegan Vultures and Vegan Daily. She has been nominated for One Bite Vegan 'Best Food Photography' Award 2019. Hi, I'm Tajda (pronounced tide-ah) and I'm a food photographer based in Manchester, UK. 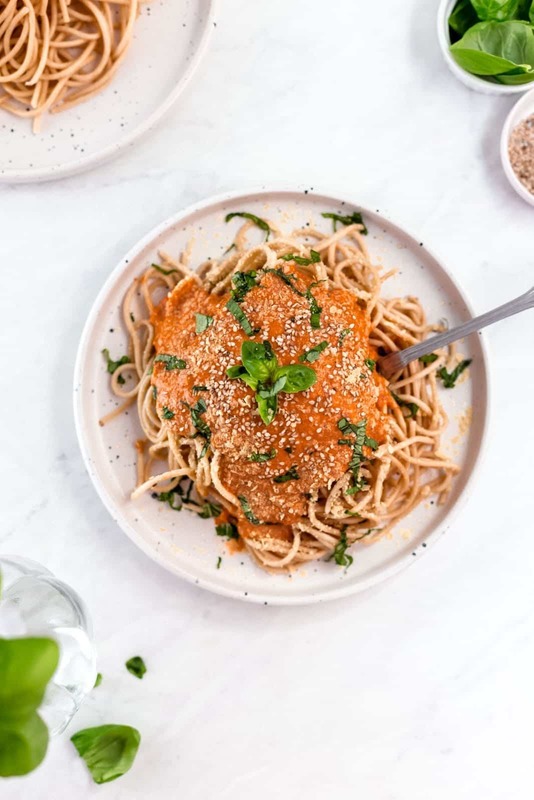 Subscribe to my newsletter and get 90 printable vegan meal ideas! Copyright © 2019 My Vegan Minimalist. All Rights Reserved.